Want to get your cards printed professionally? Do it like we do! 2. Click on Playing Cards & Puzzles, and then "Playing Cards" in the dropdown menu. 3. 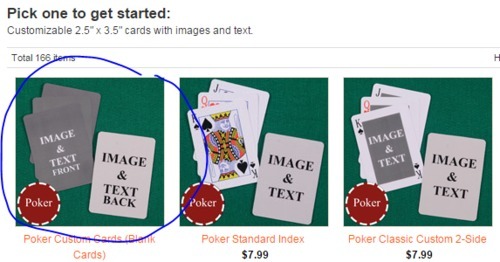 Choose "Poker Size Cards"
4. 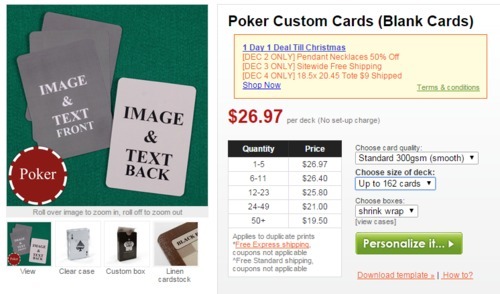 Choose "Poker Custom Cards (Blank Cards)"
5. Choose 162 cards in the dropdown menu. Click "Personalize It…"
6. Click "Different Images" under "Images and Text"
7. Start uploading all the cards! Then the rest of the Goals. Keep notes on what number each section of cards starts and ends, because you're going to have to match backs to the cards later. 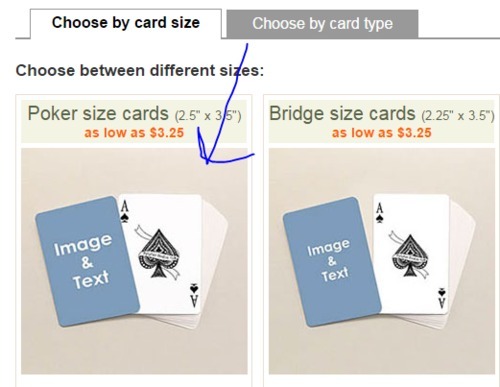 Remember, the number of a particular card is ABOVE it, not BELOW it. Save yourself from my mistakes. 8. There's a handy autofill option. Trust me, you want to use it. 9. Then hit Next Step at the top. 10. You don't want to add additional text or images, so just hit Next Step again. 11. Once again, select different images. 12. This time, upload your four card backs. 13. Remember those notes you took earlier? Here's where you use them. Now the very lengthy process of dragging cards into spots. You can't autofill this, unfortunately. It's all manual. Then hit Next Step. 14. Once again, you don't want to add new images or text, so just hit Next Step. 15. This time, you'll want to look it over. Make sure that all the right backs are on each card. It's easy to mess up. 16. At the bottom of the page, click the little checkbox that says you can get this printed. Then hit Next Step. 17. The rest is all payment information and shipping! Put all that in, and voila! You're done! 18. And once again, if you're able and inclined, we ask for a small donation per deck to help keep us in the card business!